A fillet of filmic flatulence. Since finishing the Harry Potter franchise, Daniel Radcliffe has gone out of his way to subvert his boy-wizard roots by choosing a range of quirky roles, not to mention a string of memorable comedy cameos in the likes of Extras, Trainwreck and The Simpsons. 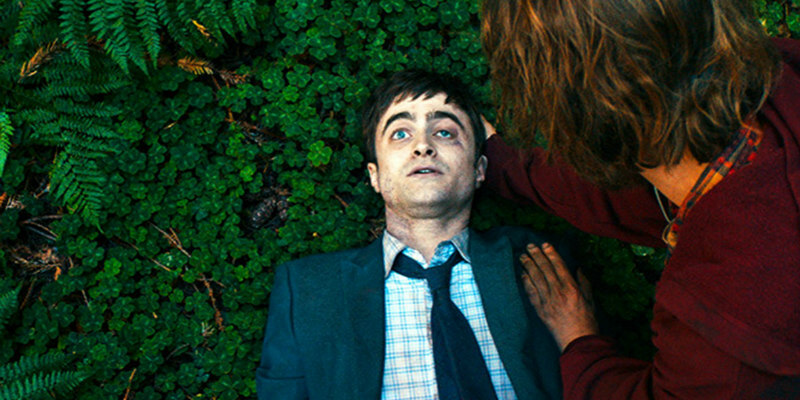 In Swiss Army Man, Radcliffe takes on his oddest role to date – that of a flatulent corpse named Manny. When Manny washes ashore on a tiny, isolated island he manages to save the life of sole inhabitant Hank (Paul Dano, There Will Be Blood), thanks to his miraculous bodily functions. Hank rides the gassy corpse off the island and an incredible story of friendship and adventure ensues. Not half as crass as you’d imagine, Swiss Army Man tackles issues of love and loneliness in a film that’s filled with creativity and imagination, along with some of the finest fart jokes ever committed to film. Another classic movie featuring a classic fart is Milos Forman’s period drama based on the life of Wolfgang Amadeus Mozart. A musical genius he may be, but the crude Mozart is happy to show he can produce sound even without the aid of an instrument; in one scene he entertains guests at a masquerade ball with a variety of piano tricks before finishing his performance by bending over, flipping up his coat tails and letting rip. Not one of his greatest symphonies. Based on the gross-out collectible card series of the same name, this eighties oddity featured characters with names including Valerie Vomit, Foul Phil, Messie Tessie and… Windy Winston. The unhinged, Hawaiian shirt-wearing Winston has a penchant for public farting, letting loose on an entire audience in one scene. Panned on release for being rude, crude and ugly in every sense of the word, The Garbage Pail Kids has since become known as one of the worst films of all time. A true stinker in every sense of the word. Think fart scenes are too low-brow for Academy Award Best Picture winners? Think again. In Rain Man, Dustin Hoffman, who picked up a Best Actor win for his performance, lets rip in the confined space of a telephone booth, much to the annoyance of his irritated brother, Tom Cruise. “I don’t mind it” says Hoffman’s Ray. Tom obviously did. In the first film of the hugely successful franchise, we’re introduced to unsociable ogre Shrek as he goes about his morning routine: showering in mud, brushing his teeth with bug juice and… catching his breakfast by farting on fish. Eurgh! If that wasn’t bad enough, there’s more gassy action in the sequel as Shrek takes a dip in a pool with girlfriend Princess Fiona. The loved up couple soon have the tepid water transformed into a bubbling jacuzzi – much to the displeasure of the gagging fairies surrounding them.